I have an aggressive black lab and chow mix. I have to chow mixes, one that is black lab and chow who's four(Dusty) and the other is a golden retriever and chow mix who's five (Izzy). They are both female, and latley Dusty has been attacking Izzy, they got in to one of the worst fights they have ever been in about a week and a half ago. While trying to pull them apart Izzy bit my mom, I know pulling dogs apart while they are fighting will only make it worse, but spraying water on them didn't help and Izzy was getting hurt. Dusty ended up doing some pretty bad damage to Izzy's ear. It got infected and we took her to the vet and she just finished her course of antibiotics and is okay. On Monday, they were playing in their little pool and Dusty attacked Izzy out of the blue, I don't know if it was because it was hot outside or what. But our vet told us to lift them up by the base of their tail so their back legs are off the ground.Although it stopped the fight alot quicker than usual, it just isn't enough, and today she attacked Izzy again while they were on a walk. We let Izzy leave the house first, and as we are walking them Izzy leads for a little while and then Dusty leads and we switch off through out the walk. But as we walked past a house with a dog, Dusty just attacked Izzy. My parents said that if Dusty doesn't stop, we have to get rid of her, and I don't want that. She's never had any training, well, neither of them have. But Dusty doesn't need basic training, she needs someone that will work with her on the aggresion. 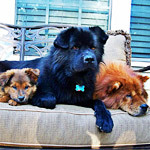 I've looked at a couple websites and most of them said that ChowChows and Chow mixes are the most dangerous dog breed, and they say that they should be put down if they are aggressive. I disagree completley, and putting her down is not an option. Re: I have an aggressive black lab and chow mix. What it seems like to me is that Dusty is trying to be the Alpha and trying to put Izzy in her place. I had this issue when my chow girl(who has since passed) was still dominate and my GSD/Aussie/??? mix was trying to over rank her. The got in a couple fights, I broke them up, made it apparent I wasn't gonna have fights and they fell into the ranks I put them in. YOU have to be Alpha. But seeing as Dusty wants to be over Izzy, make sure she is, just not over you. For example:(how I keep my ranks in order) when I would feed my crew, I would feed Tippsy(purebred chow) first, then, Jazz(black lab/chow mix), and then Dixie(GSD/Aussie/??? mix). And they don't question my authority. Another example: Jazz was eating the other day and Dixie walked by him(she should've been eating too but she wasn't interested) and in the blink of an eye he jumped on her(he's got food aggression issues). I clapped my hands, yelled "NO! ", and they knocked it off. But one suggestion: don't let them walk in front of you, or walk out of the house in front of you. Be the first in/out and teach them to heel. And I would walk them separately.